Second, Beijing has suggested that it could be reconciled to the possibility of Tsai’s being the 2016 Taiwanese president. Recently, Ma Xiaoguang, the spokesman of the Chinese Communist Party (CCP)’s Taiwan Affairs Office explained the CCP’s position toward the Taiwan election: “We do not get involved in, or comment on, the Taiwan election…We welcome any Taiwan party or person as long as they oppose Taiwan independence, recognize the 1992 consensus and promote the peaceful development of cross-strait relations.” Beijing has never denied its strong opposition to Taiwan independence since 1949, but the highlight Ma implied here is that Tsai and her party could also be welcomed, if she can find a position that both Taiwan and the Mainland China agree upon. Third, Beijing has issued a series of pro-Taiwan policies under Yu Zhengsheng, a member of the CCP’s top leadership overseeing Taiwan affairs. The Mainland “will continue to create more preferential policies to encourage cross-Strait exchange, including lifting the entry permit requirement for Taiwan residents, and recognizing Taiwan ID cards,” said Yu on June 14, at the 7th Straits Forum. Yu also urged Taiwan to participate in the Asian Infrastructure Investment Bank. Undoubtedly, these policies are Beijing’s “carrots” toward Taiwan, but the “carrots” could be real benefits to the Taiwanese people in a very short time. On the other hand, Beijing has not shown any “sticks” to Taiwan for years, except for certain routine expressions like “anti-Taiwan independence.” Additionally, in terms of the Taiwan issue, Xi Jinping’s statements are not the only barometer of the status between China and Taiwan. Yu Zhengsheng is the one in charge now and he is worth studying, especially his remarkable family background: Other than a brother who dramatically defected to the U.S. in the 1980s, he has strong family ties in Taiwan as well. Yu has publicly stated that he has relatives in Taiwan and he wanted to visit Taiwan soon. Finally, if you happen to be a fan of Chinese television dramas, you would also observe that Mainland China’s attitude toward the history of Chinese civil war between the CCP and the Kuomintang (KMT) has significantly changed. The CCP, since the Mao era, has regarded literature and art as a tool to mold and shape ordinary people’s opinions. Hence, Chinese television dramas are one of the best indicators of China’s policy. Chinese television drama used to describe the KMT as the traitor in the Sino-Japanese War and counter-revolutionary elements in the ensuing civil war. Lately, however, the KMT has become the positive force in Chinese television dramas and the KMT’s contributions in the Sino-Japanese War are significantly recognized. For example, in one recent TV drama broadcast on the CCP-managed China Central TV Station, the hero was a KMT official rather than a CCP member, a plot point that would have been inconceivable in the past. The changed view toward history offers the CCP a better domestic public opinion on the Taiwan issue and leverage in future negotiations. In fact, the CCP has already softened its position: When Taiwan’s president Ma Ying-jeou said that it was the KMT forces that won the Sino-Japanese War, China’s Foreign Ministry did not deny it, but simply added that the victory should be remembed by the whole Chinese nation. Taken together, on the Taiwan issue, Beijing’s policy is reactive rather than proactive, reserved rather than assertive, and offers carrots rather than sticks. It is fair to say that now is the best time for Taiwan Strait relations since 1949. The Taiwan Strait is far from a crisis, and will very likely remain so, even if Tsai Ing-wen were elected. First, if Tsai publicly denies the 1992 Consensus, which accepts the One China principle, but with differing interpretations of China, Beijing would be provoked into taking a strong position. But during Tsai’s latest speech in the U.S., she carefully avoided talking about anything more than “maintaining the status quo,” which is actually a very tactful way of dealing with the situation. By neither accepting nor denying the 1992 Consensus, Tsai gives herself leeway in domestic affairs as well as in cross-Strait relations. 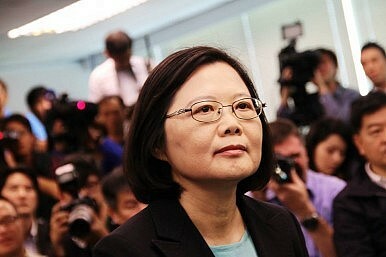 Within Taiwan, she could win the majority by differentiating her policy from the KMT. With regard to cross-Strait relations, Beijing is surely not satisfied with her ambiguity, but it could maintain its position under that ambiguity. So the first possibility seems improbable now. Second, though, if the U.S. unwisely sends the wrong signal to Mainland China – if, for instance, predicting that “a cross-Strait crisis could ensue,” the U.S. decides to preempt China and sell weapons to Taiwan – then China would undoubtedly be galvanized to respond in kind. The only way for the U.S. to avoid the self-fulfilling prophecy of a cross-Straight crisis is to maintain its current policy of “strategic ambiguity” toward Taiwan, as has been the case since the U.S. and the People’s Republic of China established diplomatic relations. Since then, the U.S. has successfully – generally speaking – remained ambiguous about Taiwan issues, and presently, this approach seems the best U.S. response. DD Wu will graduate with a Master’s in Asian Studies at George Washington University’s Elliott School of International Affairs in 2016. Her research interests center around East Asian topics. She worked as an editor in an influential market-oriented daily newspaper in China before she came to the United States to pursue her master’s degree.